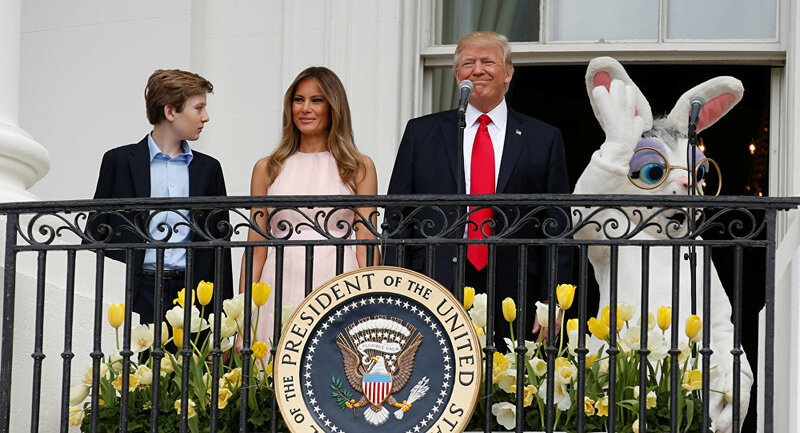 WASHINGTON(Sputnik), Andrew Feinberg — US President Donald Trump and First Lady Melania Trump on Monday welcomed their guests to the White House for the 139th White House Easter Egg Roll. Trump then sat down at a nearby table with the First Lady and his son Barron to sign holiday cards for US servicemen. Mrs. Trump also spoke to the attendees, noting this was the first time she and her husband were hosting the tradition, and wished everyone fun and beautiful days ahead. Both President and Mrs. Trump used the occasion to thank US servicemen and women, many of whom were in attendance with their children. The annual holiday event, now the largest public event put on at the White House, began in 1878 when President Rutherford B. Hayes welcomed children who had been turned away from Capitol Hill following the passage of an 1876 law forbidding the Capitol grounds from being used as a children’s playground.